Today I was studying one of my Google Adwords accounts and was somewhat surprised to discover I have several 10 Quality Scores. Now if I could only increase the search volume to this particular keyword while lowering its average cost per click, I might be satisfied. Google Adwords Editor update 7.0.0 is available for download now. I don’t know what improvements have been added yet, but will report those I discover. Update 12-17-08: For more information about specific improvements found in Adwords Editor 7.0 including keyword Quality Scores and First Page Bid estimates visit the Adwords Editor Forum. 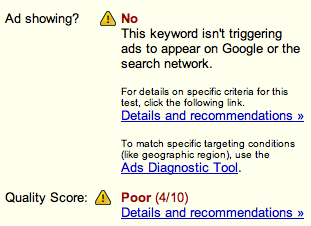 In a previous post, I requested Adwords provide Quality Score reporting options from within Adword reports. Quality Score data are now available from Google Adwords reports. By providing Quality Score report data to their advertisers, Google Adwords has taken the first step toward making Adwords Quality Score Management a reality. With Google having added numeric quality scores ranging from 1 to 10 within all Adwords advertisers accounts, an entirely new level of performance data has become available to paid search managers. 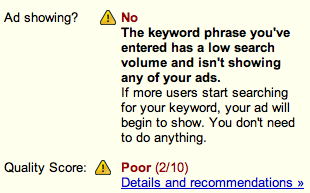 Will Google Adwords Quality Score Management soon follow? Presently, Adwords provides advertisers with ten different types of account performance reports. 1. 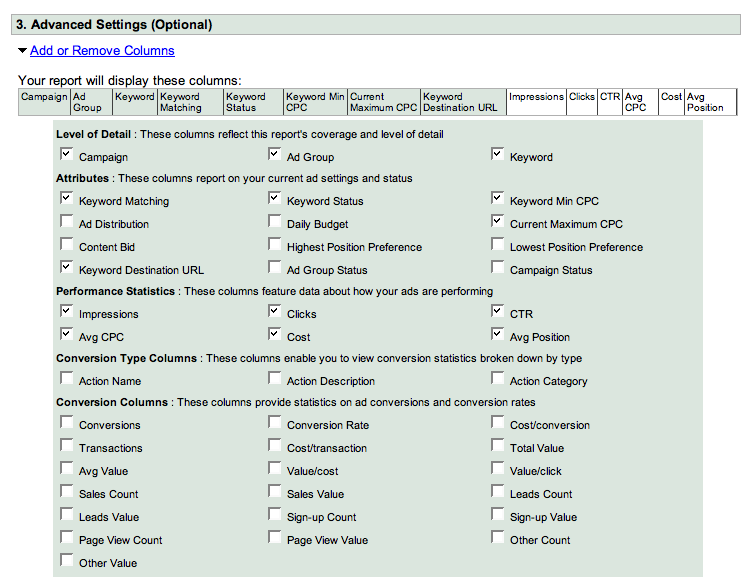 Keyword Performance: Performance data for all keywords or those in selected campaigns. 3. URL Performance: Performance data for each of your Destination URLs. 4. 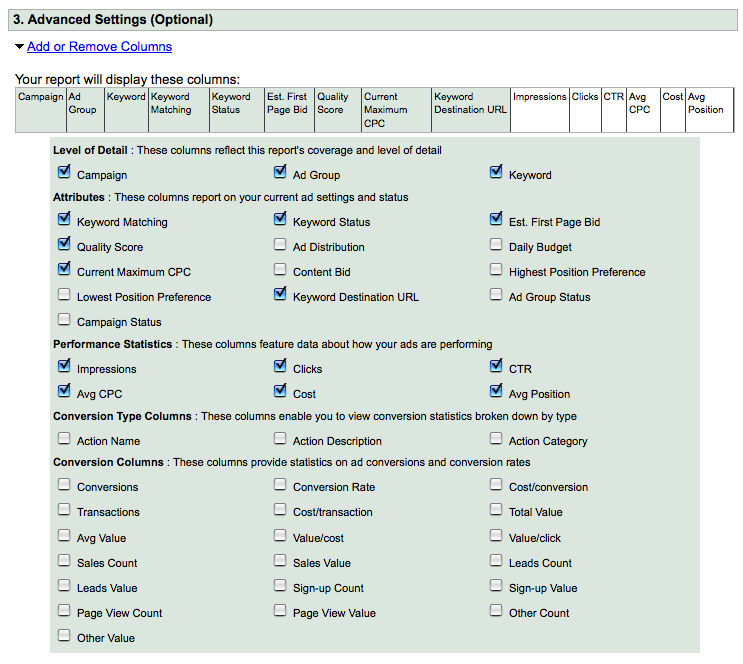 Ad Group Performance: Ad group performance data for one or more of your campaigns. 5. Campaign Performance: Performance data for your campaigns. 6. Account Performance: Performance data for your entire account. 7. Demographic Performance: Performance data for sites by demographic. 8. Geographic Performance: Performance data by geographic origin. 9. Search Query Performance: Performance data for search queries which triggered your ad and received clicks. 10. Placement Performance: Performance data for placements where your ad was placed. These ten types of Google Adwords reports provide valuable and actionable Adwords account performance data paid search managers require for making informed adverting purchasing decisions. Reports are available in daily, weekly and monthly intervals. With the Adwords reports advanced settings option, advertisers can receive an even greater degree of account performance details. Additional attributes available from the advanced settings reports include performance statistics, conversion types and detailed conversion data. With the advent of their Adwords numeric quality score, Google has now denominated the level of advertising performance it requires from advertisers. Additionally, Google has given their advertisers a new tool for further identifying, managing and improving ad and keyword performance. In exchange for their new advertising quality measurement tool, Google will ultimately get improved advertising quality. As far as I know, the numeric quality score is the first metric Google has made public to either its publisher or advertiser community that can be measured against and thus managed to. The numeric quality score is yet another milestone on Google’s road to further transparency with its advertisers. 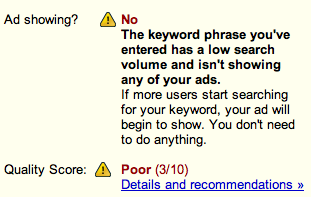 At some point, will Google provide Adwords Quality Score reporting options to its advertisers too? By providing advertisers with Quality Score reporting, advertisers will then have an another set of important data for further managing and improving the performance of their ads and keywords. By making Quality Scores available in Adwords reports, Google would initialize the Adwords Quality Score Management process. Adwords new Quality Scores have been live since September 17 according to Ophir Cohen. Nuno Macedo of Páginas Amarelas Portugal has provided me with a screen shot of his Adwords Quality Score of 10 in Portuguese no less. Each “Bid Below First Page” notice is accompanied by Google’s recommended bid for achieving first page placement. Now if only Adwords would provide Quality Score reporting options from their Report Center, large and small advertisers alike could begin to manage their Adwords account’s performance by its most important metric – the Quality Score.